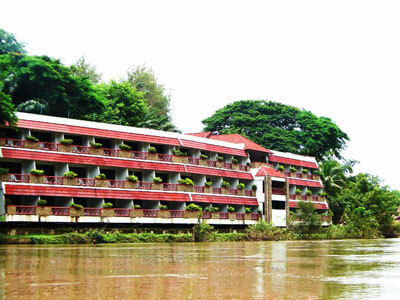 River Kwai Village Hotel (Jungle Resort) is the first jungle resort in Kanchanaburi, Thailand. We offer you an ideal vacation with tranquillity, beauty of nature, and comfortable accommodations. Only 70 kilometers from the city of Kanchanaburi in the River Kwai Valley, we offer four different styles of air-conditioned accomodations for your preference, Raftel, Mountain Wing, River Wing, and our new wing, Royal Wing. River Kwai Village Hotel is the first hotel in the region, having a "Jungle Water Park" with a water slide and Jacuzzi. The Jungle Water Park is located among the valley and the riverbank. Another swimming pll is located in the center of the hotel, where is surrounded by natural waterfalls.